Not much put more fear in the heart of a Mediterranean seafarer than the triangular sails of a Barbary corsair appearing on the horizon. The favorite vessel of these North African pirates was the xebec, a long, narrow ship descended from the rowed galleys of the ancient world. 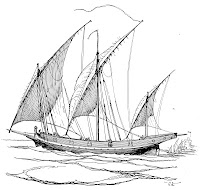 Able to sail close to the wind with its lateen sails - or to use oars if the wind failed - and able to navigate shoal waters due to its shallow draft, the xebec was the perfect ship for a pirate. It could catch most merchant vessels, and run away from warships that could reduce its lightly-built hull to splinters with a single broadside. We found in the French Ministry of Defense archives a highly-detailed plan of the Algerian xebec captured in 1830 and placed in service by the French Navy as Le Boberach. She was used mainly as a dispatch ship, where she had a well-documented, albeit fairly uneventful career. Lack of exciting engagements aside, she still has the exotic lines that would make an eye-catching model for the enterprising modelshipwright looking for something beyond the typical bathtub-hulled square rigger. Thanks to the French proclivity for record keeping, we also have a great deal of information about her service, too. As an extra treat, we threw in the plans of an 18th Century Algerian xebec documented in Fredrik Henrik af Chapman’s Architectura Navalis Mercatoria.